Our dhtmlxScheduler provides you with the different types of data visualization. Besides the popular options, such as different time scales like day or week, our scheduler gives you some additional possibilities. For example, you can combine your schedule with the map that can be pretty helpful in case you want to plan your business trip or vacations. If you’re working with ASP.NET, you may look at DHTMLX Scheduler.NET, a Scheduler control that works both in ASP.NET MVC and Web Forms. It has the similar range of views that are described below. To understand how the views work, let’s start with the default ones. This Getting Started Guide can help you build the basic scheduler. This code creates Next and Previous navigation buttons, shows you the current period, etc. 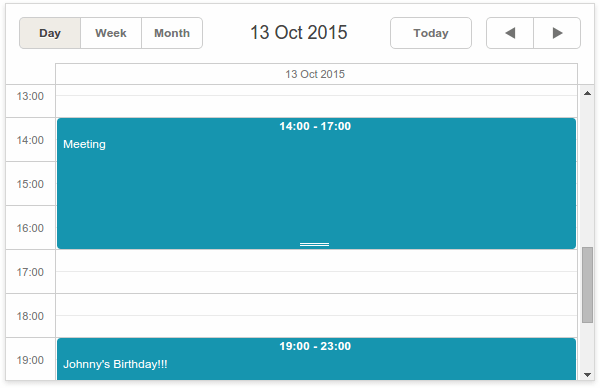 We’ve created three tabs that can be used to switch between the Day, Week, and Month views. As you can see, there are some previously created events rendered. You can double-click an empty cell to create a new event or drag the existing event through the calendar grid to change the date. Learn more: Day View, Week View, Month View. 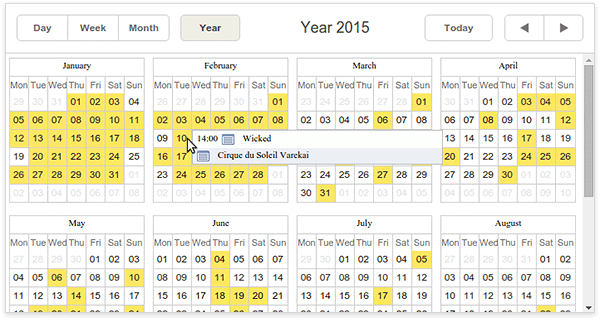 If one month is not long enough to plan your schedule, there’s always a possibility to use the Year View. The tooltip you can see at the screenshot above allows you to edit the event. Just click the “Details” icon and the edit window will appear on the screen. Learn more: Year View Documentation Page. 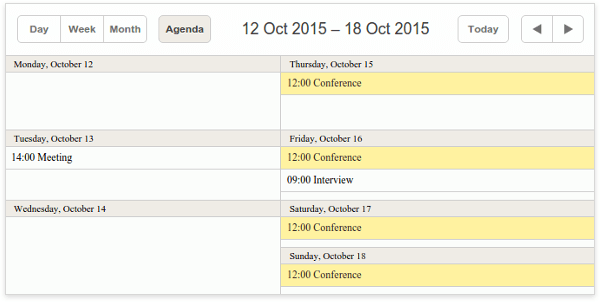 Now, let’s talk about the views that allow you to see all available events in the form of different types of lists. You can double-click on an empty self of this list to create a new event or click the “Details” button to edit the existing ones. The Week Agenda view is a combination of two views: Week and Agenda. This view shows you a list of upcoming events within a week. As you can see, this view shows you the whole week at once. You can double-click the empty cell to create a new event. Double-clicking the existing event will open the edit window. 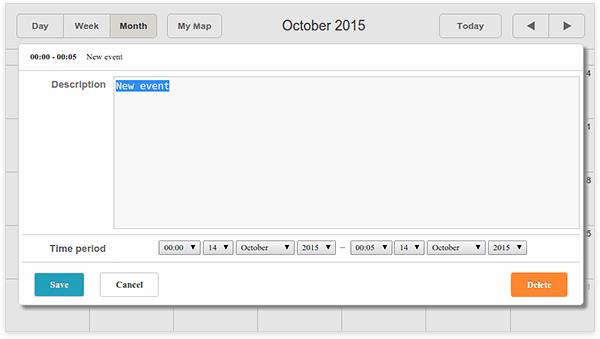 Another handy feature is events highlighting. You can click the event to select it. After you select the long term event, all related records will be highlighted. 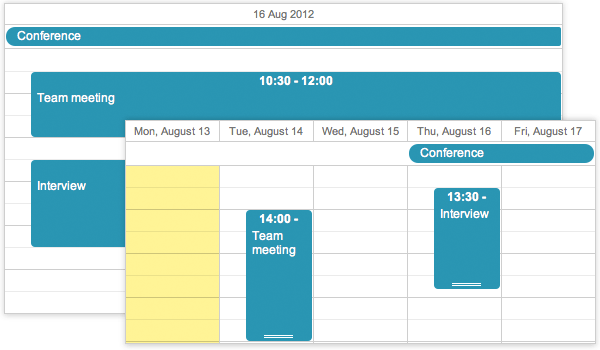 The Grid View looks similar to the Agenda view. But in this case, you can choose the data you want to display. Here’s an explanation of what we’ve done. This code will create new grid with name grid that will contain a bunch of columns that the fields property contains. In this case, we have used the id property to choose what data we you want to display. It can be the ID of the event, its beginning date, or even a comment that you’ve added. The second property in our example is label. It defines the label for the column. The last property, sort, specifies the type of content that will be displayed in this column. It specifies the way of sorting. Possible values are ind, date, and str. Besides this minimal amount of properties, many others can help you configure your application the way you want. 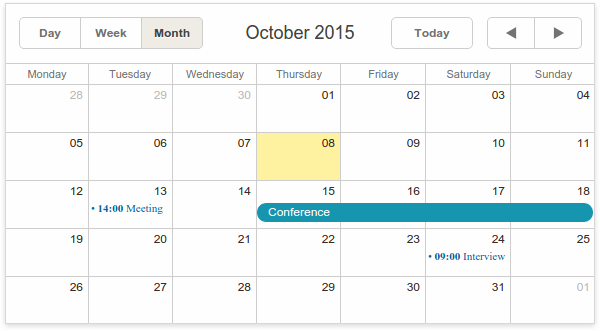 You can set the with of a column, choose the date range, use custom sorting functions, etc. Let’s start from the Timeline View. x_unit:"minute",//measuring unit of the X-Axis. It’s big enough but have no fear. Check the comments. To help you better understand what’s going on here’s little explanation. Besides the X-Axis configuration, you should also define the x-unit property that defines how many areas your calendar will consist of. In this example above we’ve created four areas with labels Section A, Section B, etc. The render property defines the view mode. There are Bar, Cell, Tree, and Days options available. 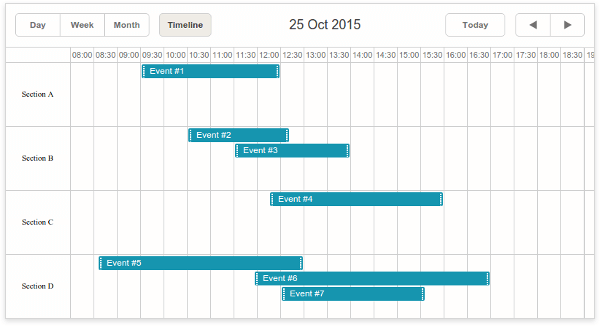 The y_property property will help you attach an event to a proper timeline area. For example, if you want to add an event to Section A you should add the following property: y_property: “1”. The Units View looks pretty much the same. The main difference, in this case, is that you can configure the X-Axis. This code will create a new view with name units. property defines the property name that can be used to define which unit will contain the proper event. The list array contains the key property that you should use to attach the event to the unit, and the label property that defines unit’s label. In this case, unit_id: “1” means that the first event will be placed within the unit with the key: 1 property. 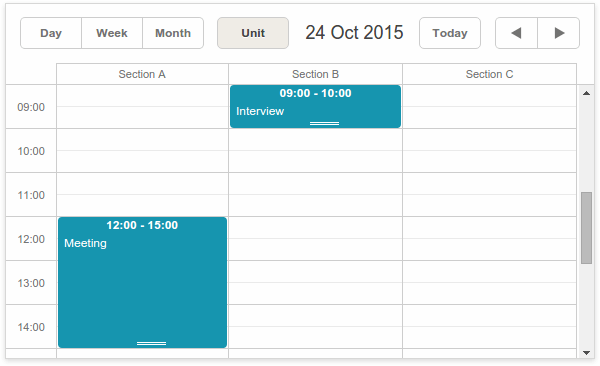 Besides this very basic functionality, Units View allows you to assign events to several units, or, for example, display units for multiple days. Better check the documentation page to learn how you can configure it. Done. 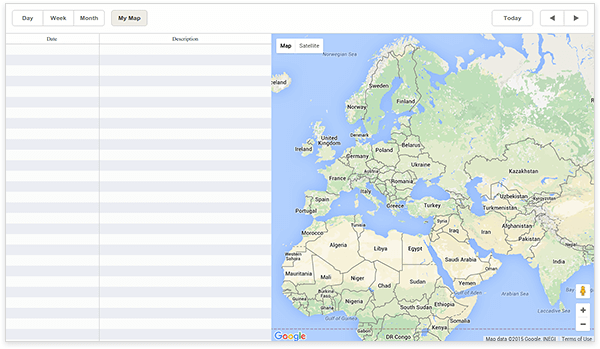 Now you able to add the location information to your events.